Freshman Rep. Alexandria Ocasio-Cortez recently captured headlines in her “60 Minutes” interview when she said the U.S. should raise taxes on a portion of the income made by America’s top earners; the idea is that once a person had made at least $10 million in a single year, every dollar coming in after that would be taxed at a rate of up to 70 percent. Many have dismissed the idea, saying it would be too radical and would damage the economy. But the Democratic representative from New York might have hit on something voters want. A new poll from The Hill and Harris X found that 59 percent of registered voters supported imposing a 70 percent tax rate on every dollar over the 10 millionth a person earns in a year. (Tax rates that apply only to income over a certain threshold are called marginal tax rates.) The idea even received bipartisan support: 71 percent of Democrats, 60 percent of independents and 45 percent of Republicans said they were in favor. In contrast, the Republican overhaul of the tax law that President Trump signed in 2017 — which decreased the marginal tax rate from 39.6 percent to 37 percent on married couples earning over $600,000 — has far less public support. A September Gallup poll found that only 39 percent of Americans approved of it. It’s perhaps not surprising that Americans would support higher taxes on top earners given that tax rates on high income brackets were once much higher than they are today. The top marginal tax rate was as high as 94 percent in the 1940s, and throughout the 1970s, Americans in the top income bracket (which in 1970 was $200,000 and above, or about $1.3 million in today’s money) were taxed at a 70 percent rate, according to the Tax Policy Center. It wasn’t until 1981, when Congress and President Ronald Reagan implemented one of the largest tax cuts since World War II, that the top marginal tax rate fell to 50 percent. 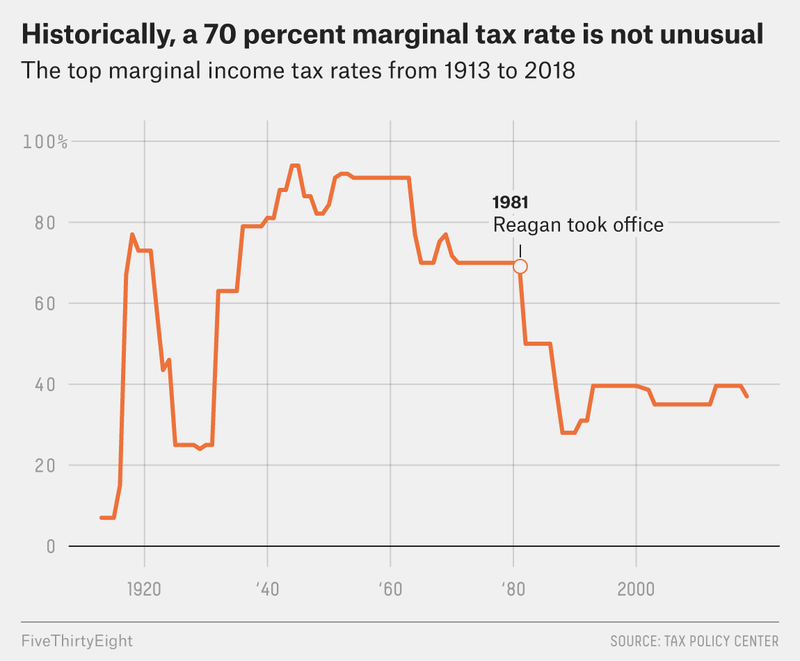 Over the course of Reagan’s term, tax reforms eventually cut the top marginal tax rate down to 28 percent. Wanting the wealthy to pay more in taxes isn’t a new idea to American politics either. According to a Gallup poll from 2016, since 1992, Americans have largely felt that upper-income earners don’t pay enough in taxes. For the last quarter century, a majority of Americans — between 55 percent and 77 percent — have believed that top earners pay too little. And a 2017 Ipsos/Reuters poll found that 3 in 4 Americans said that wealthier Americans should pay more in taxes. Ocasio-Cortez has not made any official policy proposal for a higher marginal tax rate, but she is already shaping the national conversation on economic policy ahead of the 2020 elections. Former Housing and Urban Development Secretary Julian Castro, who recently announced a presidential run, has already endorsed Ocasio-Cortez’s tax hike proposal in an interview with ABC News. And while it’s still too early to know for sure, 2020 Democratic hopefuls looking to appeal to The Left may soon follow suit. The polling news of the week continues to be the ongoing partial government shutdown, which is now the longest in U.S. history. On Wednesday, 49 percent of registered voters said in a Morning Consult/Politico survey that they blamed Trump for the shutdown. That number falls largely in line with four other polls FiveThirtyEight looked at this week, which showed that a plurality — if not a majority — of Americans hold Trump most responsible for the shutdown. A NPR/PBS Newshour/Marist poll suggests President Trump could face a tough re-election bid in 2020: 57 percent of registered voters said they definitely plan to vote against Trump, while only 30 percent said they definitely plan to vote for him. A CNN poll found that President Trump has lost ground among white voters without a college degree, who are arguably his most loyal supporters, during the government shutdown. A January poll found that 45 percent approved of his job as president, a 9-point drop from a month before, when the government had not yet shut down. Democratic House Speaker Nancy Pelosi has become more popular with voters since the 2018 election. Thirty-five percent of Americans said they have a favorable view of her in the most recent poll from Civiqs, a polling firm associated with the pro-Democrat site Daily Kos. That marks a significant improvement from Election Day, when just 27 percent of voters had a favorable opinion of her. 29 percent of Americans said “the government/poor leadership” is now the most important problem facing the country, according to a new Gallup poll. This is a 10-point increase from when Gallup last asked the question in December. Immigration was deemed the second most important problem at 21 percent, up 5 points from December. Nearly 3 in 5 Americans oppose expanding the U.S.-Mexico border wall, according to a Pew Research Center survey. Opinions haven’t changed much from a year ago, but the data suggests that the issue has become even more partisan. Now, 82 percent of Republicans support building the wall, a 10-point increase from last year. And the share of Democrats who support building a wall has dropped from 13 percent to 6 percent. After news broke last week that in May of 2017, the FBI had opened a case looking into whether Trump was working on behalf of the Russian government, an Economist/YouGov poll found that 36 percent of Americans believed that he had, in fact, been working for the Russian government. Another 36 did not believe that to be the case, while 28 percent were unsure. About 3 in 4 Americans in a Pew Research Center survey didn’t know Facebook used their personal information to target ads. Fifty-one percent said that after reviewing their “ad preferences” page, they felt uncomfortable about the information Facebook had collected. Pew Research Center also released a study that found that the political views of generation Z (age 13 to 21) are very similar to those of millennials. Like millennials, they are less likely to approve of Trump (30 percent) than older generations, more likely to say the government should play a bigger role in public life (70 percent), and more likely to say that increased racial and ethnic diversity is a good thing in society (62 percent). Another sign that Gen Zers might be more liberal — 35 percent said they personally know someone who prefers being referred to with gender-neutral pronouns. A quarter of millennials said the same. Fewer people in older generations knew someone who used gender-neutral pronouns: 16 percent of Gen Xers did, as did 12 percent of Boomers and 7 percent of Silents. According to FiveThirtyEight’s presidential approval tracker, 40.2 percent of Americans approve of the job Trump is doing as president, while 55.0 percent disapprove (a net approval rating of -14.8 points). 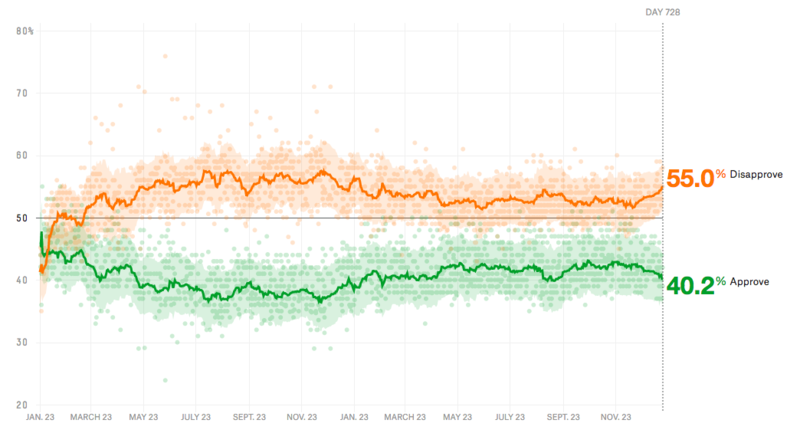 That’s almost a 2-point drop from one week ago when, 41.0 percent of Americans approved and 53.9 percent disapproved of the president (a net approval rating of -12.9 points). And his net approval rating has dropped significantly from one month ago, when he had an approval rating of 42.2 percent and a disapproval rating of 52.4 percent, for a net approval rating of -10.2 points.